Nobody likes to be sick, am I right? But it happens to the best of us. Being sick is a battle. My autoimmune system is already compromised because of MS, and I often take a lot longer than normal to recover from even a basic cold. I was sick pretty recently, and it totally knocked me for a loop. Hence why there haven't been any new posts from me for a while. Sorry about that, peeps. I have a ton of fun ideas lined up though, so don't despair. While ill I started thinking about all the stages of being sick, and I began to wonder if it's the same for all of us. So this is me! 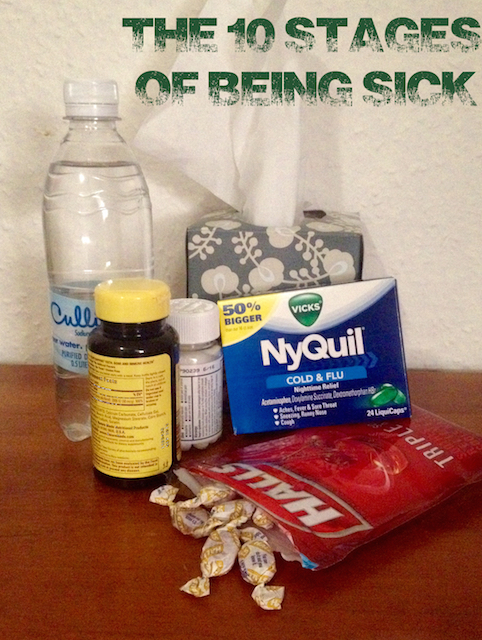 Stage 1 (Denial) - I'm not sick, I'm not sick, I'm not sick... the weather is changing, I have allergies, something. But I am not sick. Meanwhile, my fever spikes, I lose my voice, and my nose might as well be a running faucet. But I'm totally not sick. Hubs: "Honey, you should lie down and get some rest"
Me: "Are you mad? I'm fine! I need to cook dinner"
Hubs: "Honey, no one wants to eat anything you're cooking. It could be contaminated"
Me: "I'm not that sick! I have things to do. Go away!" At this point, the Hubs usually lets me fall on my face from sheer exhaustion because I am completely delirious. Not to mention unreasonable. I can't say I blame him. Stage 3 (Acceptance) - OH MY GOD, I'M REALLY SICK! Stage 4 (Panic, with a dose of self pity thrown in) - At this point, hypochondria sets in. I could have typhoid fever! I need juice, I need vitamins, I need to binge watch Dance Moms. Bring me my favorite blanket, I want to cuddle with the dog, do we have Nyquil? The fun never ends, people. 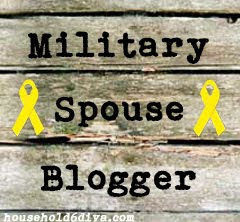 Poor Hubs deserves better. Stage 5 (Coma of Indifference) - I want to be unconscious, but I'm not. I want to watch random, trashy TV shows... but I can focus on nothing. Rather, I stare at the wall for hours at a time, bundled a foot deep in blankets, and bemoan my existence. More self pity ensues. Stage 6 (Denial. Again.) - I'm better, I'm better, I'm better! I discover this by attempting to walk downstairs on my own, and then realize I am too weak to walk back up. Cue the whining and sniveling. Stage 7 (Relapse) - Due to the second bout of denial, repeat stages 3 - 5. Stage 8 (Shower Time) - I've been wearing the same pajamas for days on end. My hair is a bad imitation of Johnny Depp's in Edward Scissorhands. Professional help may be needed. A shower is all I accomplish at this phase before I fall back into the coma of indifference. Stage 9 (Finally! Recovery) - Recovery for me doesn't mean I'm ready to dive back into work or anything. It means I can actually dress myself and walk down the stairs. I may be capable of cooking my own breakfast. This lasts for several days while my body finds its rhythm again. I spend most of this phase profusely apologizing to the Hubs for being a general pain in the you-know-what. Stage 10 (The After Party) - Oh, if only this was an actual party! That would be way better than the grueling reality of Stage 10. Ya see, this phase involves lots and lots of laundry. And grocery shopping. Disinfecting the sick room comes into play. It's not fun, my friends. Not fun at all. But the end of this stage marks the end of illness. Of course, that's until the Hubs starts sniffling as he's come down with whatever I've just recovered from. Repeat stages 1 - 10, only louder and with more whining involved (if that's even possible). So, what are your stages of being ill? Do you recover quick, or are you more like me? I'm happy to be back in the saddle again, blogging away and getting back to what qualifies as 'normal' around here. Stay tuned, there are lots of new recipes coming and all sorts of other fun things.